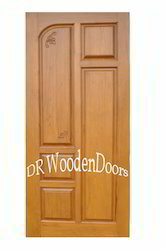 We are offering Teak Wooden Door to our clients. TEAKWOOD see through EXTERIOR DOOR in melamine finish. Solid wood doors, Intricately carved exterior door and front door in solid teakwood, rosewood, mango wood are offered in various finishes. 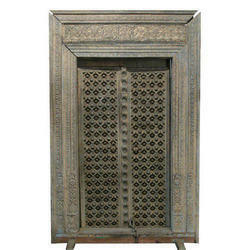 Avail from us an extensive range of carved door in orange color. Crafted with excellence, these doors are highly preferred to decorate the interiors and exteriors of houses and offices. Our range is widely accepted across the country due to wonderful designs, smooth polish, intricate carving, termite resistance and durability features. Our Teak Sunburst Door make a beautiful addition to your homes and they will make your entrance very different. There is a variety of deep colours, beautiful designs & textures to suit every taste and they will surely become a talking point for guests. Also, they are solid, strong & exclusive. EMBOSSED DOUBLE DOOR looks like solid teak wood doors as they are sandwiched with MDF sheets inside with different designs to suit customers requirements. As standard sizes are mostly available, we also arrange customised sizes as required by the customers which should be provided with stipulated time. These doors look like main engraved door. Size of door: 6'-9" X 2'-9"
Owing to our rich industrial experience and expertise, we are engaged in offering an extensive range of Teak Wood Door to meet the demands of our clients. All these products are well constructed and ensure long lasting service life.